Why do you think that Jesus will return to earth on a Yom Kippur or Day of Atonement and in conjunction with the blowing of the Seventh Trumpet? I have seen in a couple of your commentaries where you indicate that the day Jesus will return to earth to rule and reign will be on a Yom Kippur (the Day of Atonement) and that this will be when the Seventh Trumpet of Revelation is blown. What are the reasons why you believe all of this? To explain this, I will need to "connect the dots" of several scripture references. The basis of this belief arises from the fact that the four Hebraic Spring festivals/holy days were fulfilled when Jesus came the first time. As such, it seems logical that events at His next coming will fulfill the three Hebraic Fall festivals/holy days. See How is it that Jesus is the fulfillment of the Jewish Spring and Fall feasts and holy days? On the Day of Atonement (or Yom Kippur), the high priest saw the ark of the testimony, also known as the ark of the covenant. A description of this can be found in Exodus 25:10-22. The ark of the testimony/covenant, along with its atonement cover, were overlayed with pure gold. In the tabernacle, they were placed inside the Most Holy Place, behind the curtain that separated it from the Holy Place (26:33,34). God was present between the two cheribum over the ark (25:22). The original activities on the Day of Atonement were to be performed by the first high priest Aaron (Moses' brother) in the Most Holy Place of the tabernacle (Leviticus 16:1-34). Aaron was not to enter the Most Holy Place anytime he pleased, though, or he would die, since God appeared in the cloud over the atonement cover of the ark (16:2). He could enter only one day a year, and that was on the tenth day of the seventh month (Leviticus 16:29, 23:27) on the religious calendar. This was in the Hebraic month of Tishri, which was in the Fall of the year. Aaron was to take a censer of burning coals from the altar, along with some incense, and burn the incense on the fire at the altar before the Lord in the Most Holy Place (Leviticus 16:12,13). He also was to offer certain animal sacrifices to God in the Most Holy Place, including a young bull, a ram, and goats (16:3,5). There was a great deal of blood that was shed during this annual ceremony (16:14,15,18,19,27); therefore, Aaron's garments would have been spattered with blood during the process (6:27). Now, the Messiah Yeshua/Jesus, the Word of God—who also is our great High Priest (Hebrews 4:14)—will return to earth in Bozrah, Edom (located in western Jordan). His garments will be stained red/crimson because He will trample the winepress of God's wrath. Those garments will be spattered with blood, and the blood will be spilled all over the ground (Isaiah 63:1-6; Revelation 14:19,20, 19:11-13,15). The latter will take place at the gathering of both saved and unsaved people, as though they are grapes being "harvested" (Revelation 14:16-19). Grapes primarily are harvested in the early Fall in Israel. The seven-day Feast of Tabernacles is to begin being celebrated after gathering the produce of the winepress (Deuteronomy 16:13), that is the grapes. This celebration begins five days after the Day of Atonement, indicating that the latter takes place near the end of the grape harvesting season. The sword of the Messiah (Revelation 19:15) will be bathed in blood. Figuratively speaking, this blood will be from "animals" such as goats, rams, and bulls (Isaiah 34:6,7). These are names of some of the same animals sacrificed by Aaron the high priest on the Day of Atonement (Leviticus 16:3,5). But the goats, rams, and bulls slain by the Messiah will not be literal animals. Ezekiel, in speaking about the main Gog/Magog attack, explained that every kind of bird and wild animal will be assembled to eat the flesh and drink the blood of this great sacrifice on the mountains of Israel (Ezekiel 39:17). The flesh and blood will be of mighty men and princes as if they are animals such as goats, rams, and bulls (39:18). He went on to include in this group horses and riders, mighty men and soldiers of every kind (39:20). This is a direct parallel with what John also described about this battle (Revelation 19:17,18). Can you contrast the Winepress of Gog/Magog with the Battle of Armageddon? When does the Gog/Magog battle, described in Ezekiel chapters 38 and 39, occur? Now, let's look more closely at the Book of Revelation. When the Seventh Seal is opened, there will be silence in heaven for about half an hour (Revelation 8:1). During this short period, besides seven angels being given seven trumpets, another angel with a censer will burn the incense on the fire at the altar before God's throne (8:2,3). Then the angel will take a censer of fire from the altar and hurl it onto the earth, causing a series of disasters to commence (8:4). Note the similarity between the incense going up from the altar, in the direct presence of God, both by Aaron on the Day of Atonement (Leviticus 16:12,13) and by the angel upon the opening of the Seventh Seal (Revelation 8:3,4). Evidently, then, the Seventh Seal will be opened on a future Yom Kippur = Day of Atonement. Next, following the blowing of six trumpets, with their associated judgments (Revelation 8:6–9:21), the Seventh Trumpet will be blown, at which time Jesus will return to earth and will begin to rule and reign (Revelation 11:15,17). 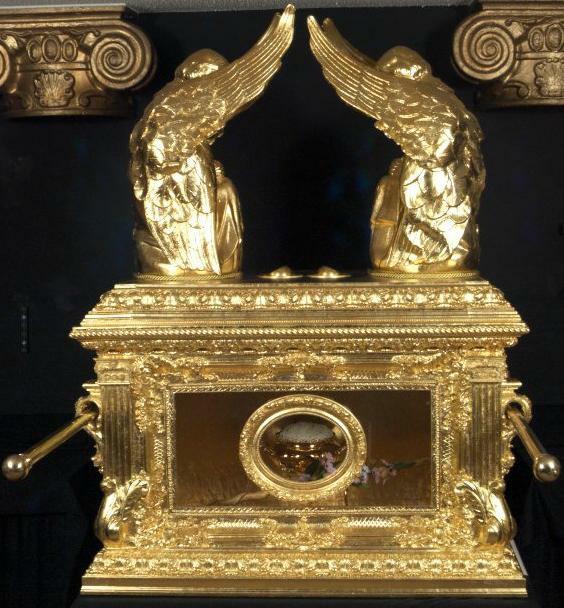 Just as the ark could be seen in the Most Holy Place of the tabernacle only once a year (Leviticus 16:2,29), the ark of the covenant will be seen in the temple in heaven (Revelation 11:19). It would seem that this will signify that the new covenant with Israel has been reinstated. The trumpet to be sounded on that day will be the Great Trumpet of Yom Kippur = Day of Atonement (Leviticus 25:9; Isaiah 27:13). However, that Yom Kippur probably will be in the year after the Yom Kippur on which the Seventh Seal is opened. How does the blood atonement of Passover differ from the blood atonement of Yom Kippur? Some believe that all seven trumpet judgments will be blown out on one 24-hour day—the day that Jesus returns to earth. At least one thing should render this notion improbable, though, and this is the fact that the Fifth Trumpet Judgment, alone, will last for five months (Revelation 9:5,10). Furthermore, consider how Isaiah indicated that God's "day of vengeance" will last for a year (Isaiah 34:8, 61:2, 63:4). Therefore, it would seem that the opening of the Seventh Seal and the blowing of the Seventh Trumpet will not take place on the same Day of Atonement but, rather, on two successive Days of Atonement, a year apart. In addition, I believe that the reason God's wrath and vengeance will be unleashed during the "day (year) of vengeance" (which will be the initial, brief, and terrifying portion of the overall Day of the Lord period) will be because of what happens after the opening of the Fifth Seal. This is when the souls of those slain will cry out for God to avenge their blood. Shortly thereafter, the Sixth Seal (Matthew 24:29; Revelation 6:12-14) will be opened, and the face of Him who sits on the throne (that is, Jesus the Son of Man) will be seen, in the clouds of the sky (Matthew 24:30), by horrified people worldwide (Revelation 6:16). At that time, on a Feast of Trumpets (Rosh HaShanah), the main Rapture event will take place (Matthew 24:30,31); and then God's dreadful wrath, vengeance, and retribution will be imminent (Revelation 6:16,17). The Pre-wrath Rapture event will enable believers to be sheltered from this wrath of God, and on this same day dead believers will be resurrected and caught up and away as well (Isaiah 26:19-21). All of these resurrected and raptured saints will appear as a great multitude before God's throne in heaven (Revelation 7:9), with many of them having come out of the Great Tribulation (7:14). This will take place on the Feast of Trumpets (Rosh HaShanah), which is observed on Tishri 1 & 2 (we will not know on which day). Soon thereafter, the dreaded "day of vengeance" will begin. On the Day of Atonement a year later, Jesus will return to earth to destroy the Gog/Magog hordes coming against Israel (Ezekiel 38:14-16, 39:1,2) and Jerusalem (Zechariah 14:2). On this day, Yeshua the Messiah will tread the winepress of God's wrath (Isaiah 63:1-6; Revelation 14:19,20, 19:11-13,15) all the way from Bozrah to Jerusalem, which is how his garments will get spattered with blood. Then He will stand on the Mount of Olives, just east of Jerusalem (Zechariah 14:4), and He will be King over the entire earth (14:9). The Father in heaven will install His Son, the Anointed One, as King on His holy hill of Zion (Zechariah 8:3), contrary to the ragings of all who are against Him, and He will rule them firmly with an "iron scepter" (Psalm 2:1-9; Genesis 49:10). Then, five days later on Tishri 15, the Feast of Tabernacles (Sukkot) will begin, when survivors from all the nations that have attacked Jerusalem will go to Jerusalem to worship King Jesus during the Feast of Tabernacles (Zechariah 14:16). I suspect that this will be a celebration of His true birthday, which is at that time of year (not at Christmas). Those perishing in Assyria and exiled in Egypt will come to worship the Messiah on His Holy Mountain (Isaiah 27:13; Psalm 48:1), and this festive observance will continue, year after year, throughout the Millennium.